Advance Tickets are available for the 2016 Fox Chapel Publishing Open House and Woodworking Show. The show takes place at the Rough and Tumble Engineers Historical Association near Lancaster, Pa., on May 13-14, 2016. This unique two-day event unites our customers, authors, instructors, and manufacturers to share their knowledge and passion for woodworking. Join us for education, inspiration, and activities to thank you—our loyal customers and readers— as we celebrate the joy of creating art from wood. 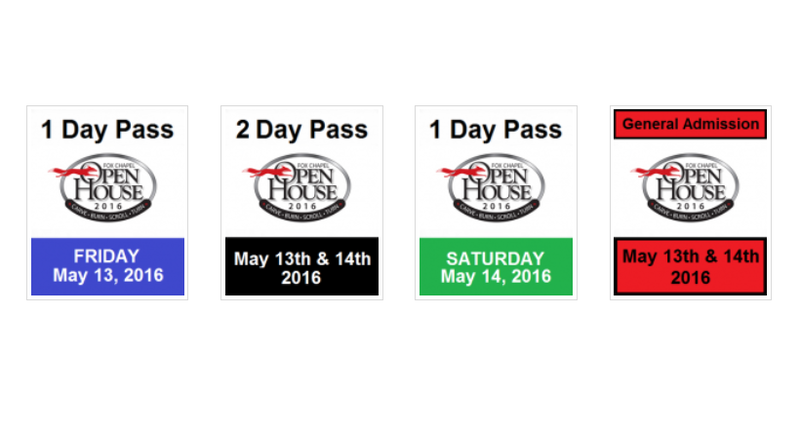 1 Day Pass for either Friday or Saturday that includes access to all Open House classes, Woodworking Show exhibits, and Rough & Tumble attractions for the selected day. If you plan to attend both days, you should consider the 2 Day pass that provides access to all Open House classes, Woodworking Show exhibits, and Rough & Tumble attractions on both days. Not interested in the classes but want to see what it’s all about? Pick up a General Admission ticket that’s good for both days. If you decide later that you want to attend some of the classes and seminars, you can upgrade your ticket (pending availability) on the day of the show. Terms of Service: By buying a ticket and attending class, you assume all responsibility for and all risk of damage or injury that may occur to you while attending, participating in, and/or observing same. This includes risk and responsibility related to possible physical injury from the use of sharp tools, wood, and related equipment, as well as improper supervision. You and your parent/guardian hereby release and discharge Fox Chapel Publishing, Rough and Tumble Engineers Historical Museum, and their director agents, employees, vendors, associates, subcontractors, and any demonstrators or instructors (hereinafter collectively “Releasees”) from all claims and causes of action, whether known or unknown, anticipated or unanticipated, which claims or causes of action may result from or arise out of Participant attending, participating in, and/or observing Activity, and agree not to sue Releasees. Participant will indemnify Releasees and hold them harmless from claims of others against Releasees on behalf of Participant, including claims for contribution and indemnification. Notes: Class topics and instructors may change. Seating may be limited. Ticket prices may be higher at the door. Some instructors may charge an additional materials fee. Scouts in uniform will receive free General Admission, but must upgrade to a Class Pass to attend classes. Some Rough and Tumble attractions, such as the train, may charge an additional fee. Tickets will be mailed a few weeks prior to the show. Thanks for ordering early! WITH QUESTIONS ABOUT THE SHOW! 2016 Early Bird Tickets are Now on Sale!